I have received calls/concerns about adjusting pruning practice based on the warm weather patterns we are currently experiencing. The questions really being asked are “when should I final prune?” and “should I delay prune?” given the high potential for yet another relatively early bud break this year. –When to make the final prune (“final prune” is defined here as pruning to several two-bud spurs if cordon training/spur pruning): This will depend on several factors, mainly related to labor availability and vineyard acreage. If you have 18 acres and two pruners, you need to prioritize to finish your dormant pruning. In this case, it may be good to hedge bets and final prune cultivars that are relatively late bud-breaking and/or on low frost prone sites first. Delaying the final prune in cultivars that are early bud-breaking and/or on high frost prone sites gives the labor a good chance to finish pruning in a reasonable time. If you have 20 acres of Chardonnay, however, this may not be a realistic option. However, maybe only five acres of that Chardonnay is planted on frost prone land; if so, it may be good to prune that last. An enterprise can wait to make the final prune on several acres in the very rare case that several pruners are available in mid- to late-March, making task completion a more realistic goal. However, again, given the general labor shortages in the industry, waiting to make the final prune across several acres during the week before / after bud break may not be realistic. 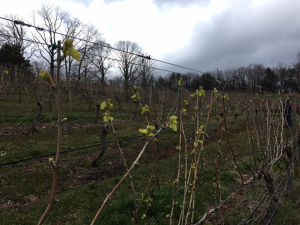 Thus, it helps to know your vineyard site to aptly hedge bets to increase your chances of frost avoidance success; this will allow pruning to be finished in a timely manner before all other early spring management task become overwhelming. In an ideal world, we could predict bud break in each of our cultivars and schedule labor and final pruning accordingly. I wish I had a silver bullet answer to tell everyone when to final prune, but I don’t. You just have to use your own judgement and take action as it makes sense given the acreage and labor situation at your own vineyard. If cane pruning, it makes little sense to wait to prune. It may, however, be worthwhile to save three or four canes, and then cut out the extra canes once frost injury has been assessed and/or the threat of frost has passed. One local grower has decided to final prune his cordon/spur pruned vines. However, he is also saving two canes in the head region (where the trunk meets the fruiting wire); in the case the buds on the spurs get killed by frost, the canes will serve to supplement bud numbers. Such practice, however, takes more time and adds another labor cost. It will take a lot of work to tie down those canes, regardless if the plan is to cut out the existing cordon or simply lay the cane over the cordon. However, that work may be justified if it ends up saving a vintage, and a near-full crop can be harvested, turned into wine, and sold. –Delayed pruning 101: Delayed pruning is a practice that capitalizes on the apical dominance of grapevines. Apical dominance results in apical buds first breaking on the top canes, and delays basal bud break (see photo below). Since basal buds will be retained, this practice could delay bud break enough to avoid frost. There is no documented benefit to delayed pruning if head training/cane pruning vines. This practice has potential to benefit only those who cordon train/spur prune their vineyards. A blog post by Michela Centinari, viticulture specialist at Penn State University, provided an in-depth review of delayed pruning, mainly by reviewing the work of Italian researchers, who conducted the research in Sangiovese. That post and both papers (Frioni et al. 2016, Gatti et al. 2016) are cited at the bottom of this blog post, but I will give the general take home points from this post and papers. 1. Delayed pruning when the apical shoots were approx. 1.6″ and 5.0″ long resulted in a 17 and 31 day delay in basal bud break, respectively, when compared to dormant-pruned vines. 2. Delayed pruning at bud swell did not affect crop yield when compared to dormant-pruned vines while delayed pruning when apical shoots were approx. 1.6″ long reduced crop yield by 26% when compared to dormant-pruned vines. 3. Fruit composition was variably affected and depended on the extent of pruning delay. While further work needs done, delay pruning did reduce Brix and increase titratable acidity (i.e. produced less ripe fruit) in one study. The take home from these studies is that delayed pruning can delay basal bud break. However, if final pruning is delayed well past the bud burst stage, crop yield can be decreased, and seasonal vine development has potential to be delayed (which may result in delayed fruit maturation). These studies showed that pruning can be delayed too much (“too much” meaning that crop yield and fruit maturity were negatively impacted). In these studies, “too much” was after bud burst. Thus, while delayed pruning can delay bud break, it may come at a cost of attenuated crop yield and/or fruit maturity if implemented well past bud burst. Further work is required to evaluate delayed pruning in regionally-popular cultivars grown in our region. Frost protection: The above assumes there is no active frost protection methods in place. A wind machine can raise temperature approximately 1-3 deg. C and cover approximately 10-12 acres. While wind machines can cost in the range of $30,000-35,000, they can “pay for themselves” if they save the crop in only one vintage. A tangential benefit, as related to the above, is that they allow final pruning to take place well before bud break, with the hope that frost will be avoided through their deployment. I am not going to go into all the details of frost protection, but an extension bulletin we developed has passed through reviews and is now in the editorial stages. It should be published in the next month or so. We will certainly share on the blog / at grower meetings when officially published, but I will share the draft now (Vineyard Frost Protection Extension Bulletin_blog share) so that blog registrants can read and hopefully use the information to their advantage. Late winter / early spring disease and weed management: I am going to refer registrants to bullets 6., 7., 9., and 10. in the “Grape Chores” section of the most recently published Small Fruits Newsletter (Small Fruits Newsletter – Vol18-Issue1). Bullets 6. and 7. relate to pruning and frost protection, but bullets 9. and 10. relate to weed and disease management in the late winter/early spring, respectively. These were written by Wayne Mitchem and Phil Brannen, our UGA Viticulture Team’s weed and disease management specialists, respectively. If you have further weed or disease management questions at this point, questions please contact Wayne (mitchem@ncsu.edu) or Phil (pbrannen@uga.edu). Also, both Wayne and Phil will be presenting at our vineyard pest and canopy management workshop on March 14th. To register and learn more about that workshop, please see previous blog post (https://site.extension.uga.edu/viticulture/2018/01/vineyard-pest-management-and-spray-schedule-workshop/). Friend AP, and Trought MCT. 2007. Delayed winter spur-pruning in New Zealand can alter yield components of Merlot grapevines. J. Grape Wine Res. 13: 157–164. Frioni T, Tombesi S, Silvestroni O, Lanari V, Bellincontro A, Sabbatini P, Gatti M, Poni S, Palliotti A. 2016. Post-bud burst spur pruning reduces yield and delays fruit sugar accumulation in Sangiovese in central Italy. J. Enol. Vitic. 67:419–425. Gatti M, Pirez FJ, Chiari G, Tombesi S, Palliotti A, and Poni S. 2016. Phenology, canopy aging and seasonal carbon balance as related to delayed winter pruning of Vitis vinifera cv. Sangiovese grapevine. Frontiers in Plant Sciences 7:1–14. Article 659. Posted in Bunch Grapes, Muscadine Grapes, Pest management Guidelines, Weather. Bookmark the permalink. Next: Have we already seen the last frost of the year?